I am not especially keen on military history. I mean I am absolutely fascinated by what actually happened in an ancient battle (very nasty indeed, I can assure you), but I hate those histories of ancient Rome that simply lurch from one round of military conquest to the next. So when we were making the first episode of Mary Beard's Ultimate Rome: Empire Without Limit, I didn’t particularly look forward to the day we were due to visit the site of a great naval battle between the Romans and Carthaginians in 241 BC, a few kilometres off the Sicilian coast. And, to be honest, I’m a lousy actor – if I don’t feel enthusiastic, I am very bad at pretending to be on camera. Even our unflappable producer showed signs of being worried. She needn't have been. When we got out to sea it was impossible not to get interested. There is something quite extraordinary about the best-preserved battle site in the ancient world being under water. But that’s more or less the case. Much of the detritus from the wrecked ships (the victims’ armour, the food containers…) sank safely to the sea bed, and it is now being investigated using deep sea probes and cameras. I was absolutely glued to the screen in the control room of the boat, watching the eerie glimpses of the bottom of the sea, the fishes and the weed mixed in with the lost equipment of those long-dead sailors. When the archaeologists spot something really special, they have clever devices to lift it to the surface. And our afternoon’s trip was to Palermo, where some of the best finds are kept. Among the highlights there are the bronze ‘rams’ that were once fixed onto the ships (for ‘ramming’ the enemy) and some bronze helmets. And, as the film captures, by this stage, I had really got into the spirit of it. And in fact I tried a Roman helmet on. I fully expect to have some emails ticking me off for this. But let me assure you that, wherever we go, we obey the conservation rules of the museum concerned (that’s why sometimes it’s gloves, sometimes it isn’t - theories and rules about all of this differ). And honestly I don’t think that the object in question came to any harm. I was perhaps a bit carried away though. As I fitted it onto my head, I said on camera just what I was thinking: words to the effect of: “I bet I’m the first to put this on for more than 2,000 years”. That’s certainly how it felt at the time. But in retrospect, I very much doubt it. My guess is that that particular helmet has been tried on rather a lot since it came out of the water. And I bet that almost every single modern wearer has had that same romantic fantasy as me... naively imagining that the last head inside it was a Roman one! 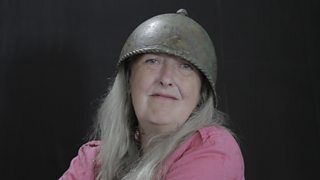 Professor Mary Beard is a classicist and the presenter of Mary Beard's Ultimate Rome: Empire Without Limit. 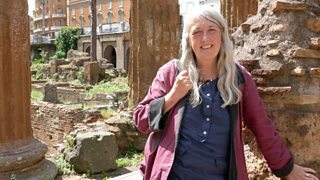 Mary Beard's Ultimate Rome: Empire Without Limit starts on Wednesday, 27 April at 9pm on BBC Two. It will be available to watch in BBC iPlayer for 30 days after broadcast on TV. Mary will be blogging about every episode - her posts will go up every Wednesday of the series.